Jan 8 1935 - Aug 16 1977. My All-Time Absolute Classic Movies List October 2018. I finally decided to write a list of my all time favourite films / Series, and here it is. The list is in alphabetical order. Hope you like these too. 09 - Silent Running (Film) - Trailer. I finally decided to write a list of my all time favourite actors, and here it is. The list is in alphabetical order by first name, rather than who's on top of my list. There are some great stage actors here. 17 - Hank Azaria - The Simpsons (Series), The Mystery Men (Film). 21 - James Purefoy - Solomon Kane (Film). 46 - Terence Stamp - Adjustment Bureau (Film), Valkyrie (Film), Alien Nation (Film), Get Smart (Film), Superman. What can I say about this fantastic movie other than I absolutely loved it. The movie was 1 hour and 43 minutes of sheer fun. It reminded me of my own youth and that the child remains in all of us, regardless of how old we get. There have been a lot of bad reviews about this movie being childish, well I disagree. I personally think it tries to speak to not only children but also to the child that remains inside adults. Yes some of the animal talk was daft, but when you had your own childhood, own imaginary friends and an imaginary world, then thats how you spoke. Just because you're older doesnt mean the childish part of you leaves. Pooh Bear "Peaple say nothing is impossible, but I do nothing everyday." I appreciate that a film is about two hours long and that the story has to be moved forward, and that some parts are missing that you need to fill in yourself, but the only downside to this movie was that it wasnt long enough. I truely believe that it should have been the full two hours. The connection between the adult and the child that remains inside of you should have been better explained. This film tried to remind everyone that even though we grow up and go into the real world, the child still remains, and its telling / reminding us that sometimes we have to step from the serious adult world, and let the child out. We need to remember that family is important too and that we cant forget about it. 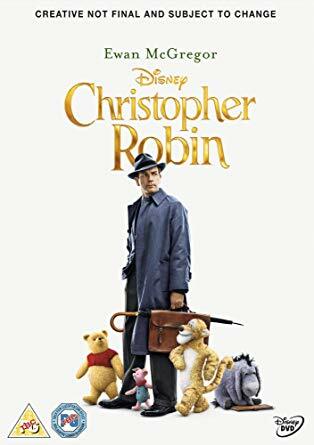 The final scene of this movie was Christopher's daughter finding the animals (with her mother and father in tow), her father could re-live his childhood along side his daughter, and rekindle his relationship with his wife, and he found that he was missing out on an important part of his life.......his family and the wonderfull connection, and he found it with the help of his own childhood animal friends. I will be definately getting the DVD when its released. And just for your entertainment here is one of the official trailers. I dare you to watch it and not like it. If you hate it then you need to get someone to check if you have a pulse. So take my advice, go see this film if its still at the cinema, but go buy the DVD and watch it with a cuppa, and your own family. We always like to hear great feedback, or comments, from visitors.